Lavandula officinalis Chaix ex Vill. Lavandula angustifolia (lavender most commonly true lavender or English lavender, though not native to England; also garden lavender, common lavender, narrow-leaved lavender), formerly L. officinalis, is a flowering plant in the family Lamiaceae, native to the Mediterranean (Spain, France, Italy, Croatia etc.). It is a strongly aromatic shrub growing as high as 1 to 2 metres (3.3 to 6.6 ft) tall. The leaves are evergreen, 2–6 centimetres (0.79–2.36 in) long, and 4–6 millimetres (0.16–0.24 in) broad. The flowers are pinkish-purple (lavender-coloured), produced on spikes 2–8 cm (0.79–3.15 in) long at the top of slender, leafless stems 10–30 cm (3.9–11.8 in) long. The species name angustifolia is Latin for "narrow leaf". Previously, it was known as Lavandula officinalis, referring to its medicinal properties. English lavender is commonly grown as an ornamental plant. It is popular for its colourful flowers, its fragrance, and its ability to survive with low water consumption. It does not grow well in continuously damp soil and may benefit from increased drainage provided by inorganic mulches such as gravel. It does best in Mediterranean climates similar to its native habitat, characterised by wet winters and dry summers. It is fairly tolerant of low temperatures and is generally considered hardy to USDA zone 5. It tolerates acid soils but favours neutral to alkaline soils, and in some conditions it may be short-lived. 'Hidcote Giant'. A Lavandula x intermedias lavandin. Very vigorous grower (90 to 100 cm; 36-40 in) with a lovely strong fragrance. This has large deep Lavender-purple flowers on very long 60 cm (24 in) stems. 'Vera' 75 to 90 cm (30-36 in). Thought to be the original species lavender, harvested for its oil. The flowers and leaves are used as a herbal medicine, either in the form of lavender oil or as a herbal tea. The flowers are also used as a culinary herb, most often as part of the North American version of the French herb blend called herbes de Provence. Lavender essential oil, when diluted with a carrier oil, is commonly used as a relaxant with massage therapy. Products for home use, such as lotions, eye pillows (including lavender flowers or the essential oil itself) and bath oils, etc., are also used. Both the petals and the oil are the most popular ingredients in handmade soap. Dried lavender flowers and lavender essential oil are also used as a prevention against clothing moths, which do not like their scent. Lavandula angustifolia is included in the Tasmanian Fire Service's list of low flammability plants, indicating that it is suitable for growing within a building protection zone. Lavandula hybrids are referred to as lavandins. Hybrids between L. angustifolia and L. latifolia (spike lavender) are called Lavandula x intermedia. They bloom later than the ordinary English lavenders. 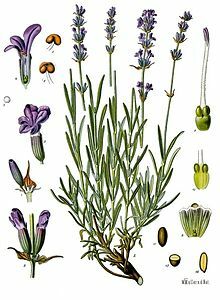 ^ a b c d "Lavandula angustifolia". Germplasm Resources Information Network (GRIN). Agricultural Research Service (ARS), United States Department of Agriculture (USDA). Retrieved 2008-04-12. ^ "Lavandula angustifolia". Natural Resources Conservation Service PLANTS Database. USDA. Retrieved 23 January 2016. ^ USDA Plant Hardiness Zone Map. Retrieved on 2008-05-22. ^ "AGM Plants - Ornamental" (PDF). Royal Horticultural Society. July 2017. p. 59. Retrieved 19 March 2018. ^ "RHS Plant Selector - Lavandula × intermedia 'Alba'". Royal Horticultural Society. Retrieved 21 May 2013. ^ "RHS Plant Selector - Lavandula angustifolia 'Beechwood Blue'". Royal Horticultural Society. Retrieved 21 May 2013. ^ "RHS Plant Selector - Lavandula angustifolia 'Hidcote'". Royal Horticultural Society. Retrieved 21 May 2013. ^ "RHS Plant Selector - Lavandula angustifolia 'Imperial Gem'". Royal Horticultural Society. Retrieved 21 May 2013. ^ "RHS Plantfinder - Lavandula angustifolia Little Lottie = 'Clarmo'". Retrieved 19 March 2018. ^ "RHS Plant Selector - Lavandula angustifolia 'Miss Katherine'". Royal Horticultural Society. Retrieved 21 May 2013. ^ "RHS Plantfinder - Lavandula angustifolia Miss Muffet = 'Scholmis'". Retrieved 19 March 2018. ^ "RHS Plant Selector - Lavandula angustifolia 'Nana Alba'". Royal Horticultural Society. Retrieved 21 May 2013. ^ "RHS Plant Selector - Lavandula × chaytoriae 'Richard Gray'". Royal Horticultural Society. Retrieved 21 May 2013. ^ "RHS Plant Selector - Lavandula × chaytoriae 'Sawyers'". Royal Horticultural Society. Retrieved 21 May 2013. ^ "RHS Plant Selector - Lavandula × intermedia 'Sussex'". Royal Horticultural Society. Retrieved 21 May 2013. ^ "Plants for a Future". ^ Chladil and Sheridan, Mark and Jennifer. "Fire retardant garden plants for the urban fringe and rural areas" (PDF). www.fire.tas.gov.au. Tasmanian Fire Research Fund. Wikimedia Commons has media related to Lavandula angustifolia. This page was last edited on 27 March 2019, at 04:41 (UTC).